It would be useful if stretch marks were tethered to the underlying tissue. Stretch marks are not marks - they are in fact very deep scars. Scars are often tethered to the underlying structures. During the formation of a scar, everything is "glued together" by scar tissue. Later, during the maturation of the scar, the part of scar tissue that connects it to the underlying structures should be reabsorbed and the scar should be "freed" but it does not always happen. When you for example injure yourself or when you have chronically inflamed acne, the primary goal of the body is to fix it and to fix it quickly and efficiently to prevent infections etc. Gluing everything together is probably the quickest way and our body is not concerned with appearance of the scar. However, not every scar is tethered. The main reason why stretch marks are indented is because the skin layers are atrophied and the tissue is missing. Tethering might be an additional problem, at least in some cases but the missing tissue is the main cause. If your skin is sun-damaged, you can try Tretinoin (Retinoic acid) cream (we sell it). Initially, it makes skin dry and the dryness makes wrinkling temporarily more visible but the skin gets used to Tretinoin and long term, it improves the appearance of wrinkling. There are even studies claiming that Retinol (Retinol is metabolized to Retinoic acid in the skin) improved cellulite but I am not sure how effective this is in reality. No, do not use needles longer than 2 mm. Skin is not any thicker than that, except for certain special areas such as foot soles A 2 mm dermaroller penetrates about 1.8 mm to the skin. A group of 20 women with moderate cellulite of the thighs were treated twice daily on one side for 6 months with a 0.3% stabilized retinol cream while the opposite side was treated with the vehicle, following a double-blind format. Objective measurements included ultrasound measurement of thickness using a 20 MHz B-scan, and laser Doppler velocimetry for blood flow. The panelists and a dermatologist estimated the degree of improvement on a global scale. Of 19 subjects, 13 rated the retinol side as more improved, 7 registering good effects. The dermatologist's estimates were largely congruent with those of the subjects. There was also a marked reduction in the density of hypoechogenic areas on the retinol sides, from 53% to 18% of black pixels on image analysis. Blood flow measurements were unchanged on the vehicle sides but increased significantly on the retinol sides. Thickness measurements by ultrasound scan were unchanged on the vehicle sides but increased significantly on the retinol sides, from 1.44 to 1.60 mm. Retinol may be viewed as a prodrug which the skin metabolizes to retinoic acid. The beneficial effects of retinol are consistent with previous reports of increased synthesis of glycosaminoglycans and collagen. Dermarolling / Microneedling / Re: Dermaneedling stretchmarks - what exactly do I need? The longer you leave it on the stronger the numbing will be. The usual dose is 1.5 g to 2 g of cream for an area of 10 cm², applied for 2 to 5 hours under a dressing (food wrap foil). If you apply less and for a shorter time, it will also numb, but less. Do not apply any numbing cream on extensive skin areas during one session. You can apply it every day but do not apply it on really large areas in one go. Sorry for the delayed answer. We were on holidays. You seem to have several scars (not very deep) and mainly enlarged pores. Try either a 0.2 mm dermaroller and a 1.5 mm dermastamp or a 0.5 mm dermaroller and a 1 mm dermastamp. I do not know how deep your scars are but if they are only one month old and they are a result of skin abrasion during the accident, there is a big chance they will heal without leaving any scar. Do not use anything on them (apart from moisturizing - the more you moisturize the better) for first eight weeks. Then you can start with dermarolling or dermastamping. If you have old scars with hardened collagen (such as surgical scars, accident scars, burn scars, stretch marks etc), apply Tretinoin cream (we sell it) right after rolling/stamping/needling. No, you are confusing two different rolling methods. The method you quoted first is a method that not everybody understands, so the method you mentioned second is the alternative method. I have updated the instructions to make it clearer. All you really need to know is that you need an uniform prick density of 200 per cm². With that, and the number of needles and the size of the roller, you can determine yourself how many times you should roll. Twelve times if you roll over the exact same skin strip every time. But over larger skin areas, use the recommended displacement method of 3 mm and roll six times horizontally and six times vertically. Dermarolling / Microneedling / Re: Dermarolling on hypertrophic scars on nose and is it safe while on accutane. I see that you again urged us to ship to India - I removed that posting because it was a duplicate - I am sorry but we do not ship to countries where even tracked packages regularly disappear. Dermarolling / Microneedling / Re: Would you consider selling suction cups for scars? Actually, we will have them in stock hopefully at the end of next month or perhaps sooner. The sales price will be around 23 dollars and there will be several differently sized suction cups. Dermarolling / Microneedling / Re: 0.2 mm roller hurts a lot - is this normal? I found the "no pain" assertion you referred to. I removed it, thank you for pointing that out. (We've sold out of EMLA at the moment.) To my knowledge, there exists no other consumer product that numbs as well as EMLA. We're trying to import an alternative product but it certainly won't numb any better than EMLA. Dermarolling / Microneedling / Re: 0.2 roller hurts a lot - is this normal? I am not sure I ever wrote that the 0.2 mm is painless. If I did, I was being overly optimistic, because it hurts. I know there are sites that claim the shorter-needled rollers are painless. Well, that's not true at all. The first time I rolled with a 0.2 mm roller on my cheeks, it was very painful. So yes, it is completely normal. Others can perhaps comment as well about their experience? A-Ret very rarely gets confiscated by the customs of various non-EU countries. It is exceedingly rare but it happens, also in Canada. Buy the 0.025%. It contains just 18 g and it is the cheapest. If you skin takes it without any problems, apply it every day. Next time, you can buy the 30 g 0.05%. You should wait about two weeks after the PDT treatment. Sorry, the link I gave you did not work. It should be OK now. 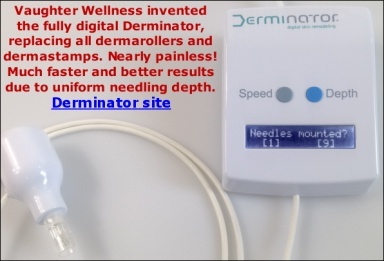 It is not recommended to use a dermaroller while on Accutane. You can do a very small test patch to find out how it heals. Repeat the test patch several times to be sure. I am glad your hypertrophic scars improved after microneedling. Scabs must always be left alone until they fall off by themselves. If you remove scabs forcibly/prematurely, it will very likely leave a scar. Removing whiteheads is also a bad idea. I understand that having a whitehead is annoying and it is difficult not to squeeze it but you should try not to. If the pores left after removing the whiteheads are very fresh, they will probably shrink a little by themselves. You can definitely use it on your surgical scar. Fraxel is very painful because it evaporates tiny columns of skin so if you could handle that, you can handle anything..